This trip requires longer boat rides and sometimes a little choppier water, therefore we use a custom 18ft. 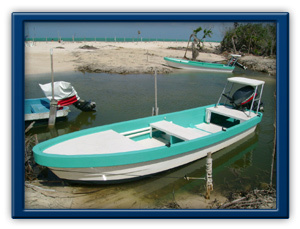 Panga with a 40hp Yamaha four-stroke engine which will make those rides with little effort. Also, these Pangas can be poled in less than ten inches of water so we face no restrictions when out on the flats. For our trips in Cancun we use a 17ft Maverick Mirage outboarded with a 2004 70hp Suzuki four-stroke to ensure a comfortable ride and absolute silence when being poled. 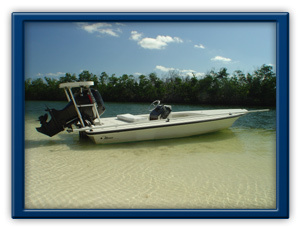 Little more needs to be added on this kind of boat for the experienced saltwater light tackle or fly fishing angler. When you know you'll be fishing on a "Maverick" you know you'll be fishing on a boat that is a leader in the flats fishing industry. The rods we supply are G-Loomis rods with Orvis reels to ensure that you won't lose that fish due to equipment failure. We use floating lines for the flats and slow sinking lines for the channels. We supply you with all flies and leaders, and of course you're welcome to bring your own gear. An 8wt. rod will cover you. The rods we supply are medium/fast action rods together with Penn or Shimano Reels. These make the perfect combination for a hassle free day of fishing. If you're planning to bring your own gear, make sure your reel holds about 150 yo 200yards of 10 to 12lb test line.